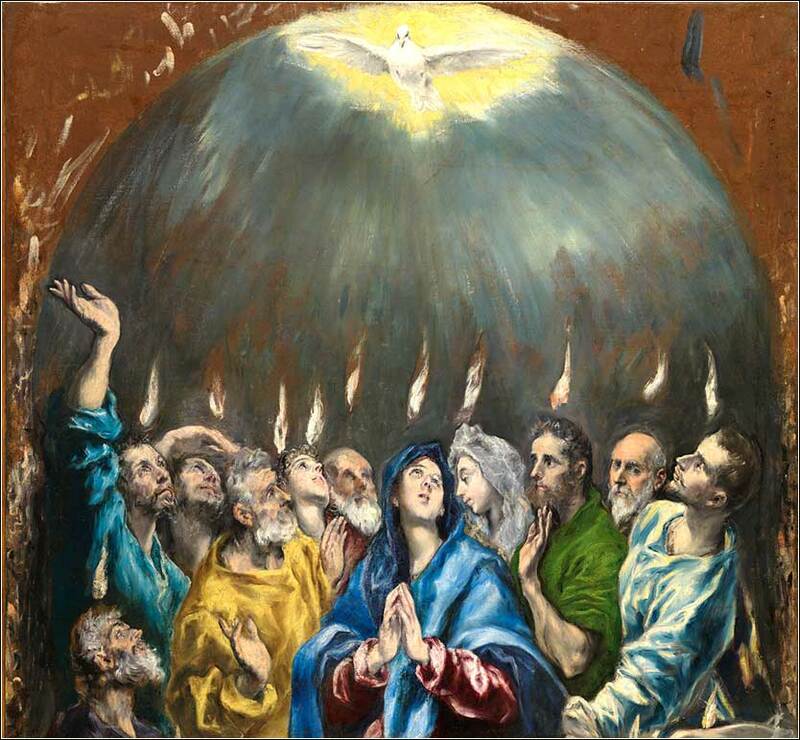 Pentecost by El Greco, ca. 1596. (See Full Size). Christ Jesus, before ascending into heaven, You promised to send the Holy Spirit to Your apostles and disciples. Grant that the same Spirit may perfect in my life the work of Your grace and love. The Spirit of Counsel that I may choose the surest way of doing Your will, seeking first the Kingdom. 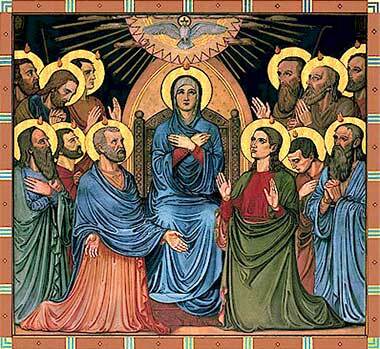 Coptic (Egyptian) painting of the Pentecost in icon style, artist unknown. Many Christians are surprised to learn that Pentecost was originally a Jewish holiday called the Feast of Weeks. It was named “Pentecost” by Greek-speaking Jews, meaning “fiftieth”, because it occurs exactly fifty days after Passover ends. It is no longer a major holiday for most Jews but was extremely important in ancient times, as it was one of the three pilgrimage feasts — feasts where Jews were expected not to work and, if possible, travel to Jerusalem — established by the Lord in the original Mosaic Law. (Exodus 34:22-26) It was a harvest festival; this seems strange to those who live in more northern countries and associate grain harvest with late summer, but in Palestine, cereal crops ripen in April and May. As one of the three pilgrimage feasts, Jews were gathered in Jerusalem from all over the known world. Those who lived far away might visit Jerusalem only once in their lives and would, understandably, begin their visit during Passover and then stay for fifty days to celebrate the Feast of Weeks. And what a surprise they had in store! Nobody knows why God waited ten days after Christ's Ascension to bring the Holy Spirit to the disciples, as promised by Christ (e.g John 16:5-8), and it had been a miserable ten days for the disciples. About 120 hard-core believers were huddled together, hiding from the Sanhedrin, in the upper room of a building in Jerusalem. The drama of the Holy Spirit's coming is fully described in today's Scripture. There is, however, one particular point to be made: the Holy Spirit came upon the believers, not the crowd, and it was the disciples who were speaking in foreign languages, not the crowd who were hearing in their own languages. The term “speaking in tongues” has become misused in modern Christianity. In English, a secondary meaning of tongue is language, i.e. we might say someone is speaking in his “native tongue”. In Greek, even more so: Greek had one word, “glossa”, that meant both tongue and language. The disciples were speaking in languages. They did not make ecstatic utterances in unknown sounds; they spoke God's praises in Latin, Greek, Parthian, Egyptian, etc. When Paul says in 1 Corinthians 14 that, someone should speak in tongues during a service only if an interpreter is present, he does not mean some sort of supernatural interpreter who can decipher unknown noise. He means an interpreter in the normal sense of the word: someone who speaks the language that the speaker is using. By the same token, though, criticizing other people's form of worship is prideful and destructive. There is no liturgy in the Bible. People who turn up their noses at Pentecostalists, because they use ecstatic utterances in their worship, should be thinking about the log in their own eye instead of the splinter in someone else's.